Fresh excavation work has begun at Keynsham cemetery, near Bristol, on the site of a possible Roman temple. In 1877 substantial remains of a large Roman building were uncovered by workers building mortuary chapels. Archaeologists have spent two years conducting geophysical surveys in part of the old Victorian burial ground. 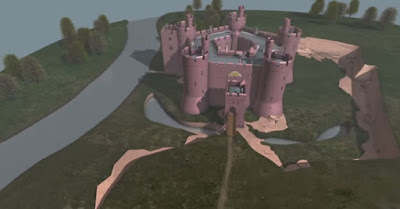 They believe they have located part of a religious healing sanctuary which could be connected to the recently identified Roman town of Trajectus. An inhospitable sea stack on the Aberdeenshire coast has been confirmed as the site of the earliest Pictish Fort and pre-dates the iconic Dunnottar Castle, carbon dating has revealed. The sea stack to the south of Stonehaven, known as Dunnicaer, was excavated by archaeologists from the University of Aberdeen in April. Despite its small size, the team led by Dr Gordon Noble, believed it would yield important archaeological finds. Their initial surveys found evidence of ramparts, floors and a hearth and now samples found in the excavation trenches have been carbon dated. Archaeologists, Prof. Nicholas Conard and his team member Maria Malina, present the discovery of two fragments of a new female figurine in today's edition of the journal: Archäologische Ausgrabungen Baden-Württemberg. 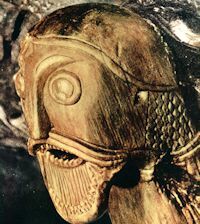 The figurine shows similarities with the well-known Venus from Hohle Fels that Prof. Conard published in 2009. The two pieces of carved mammoth ivory fit together to form a find with dimensions of 23 x 22 x 13 mm. 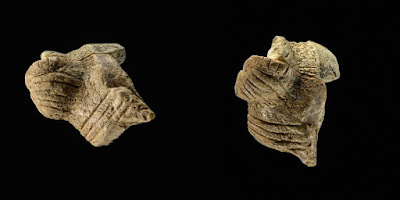 The find does not appear to be part of a depiction of an animal or lionman, both frequent motifs from the caves of the Swabian Jura of southwestern Germany. Instead, the find shows strong affinities with the only other female figurine known from the region. The find will be exhibited as part of a small research exhibit at the Museum of Prehistory in Blaubeuren. Bulgarian archaeologists recently discovered an 11th century fragment of a distillationvessel used for the production of the country's traditional fruit brandy, which is known as rakia. 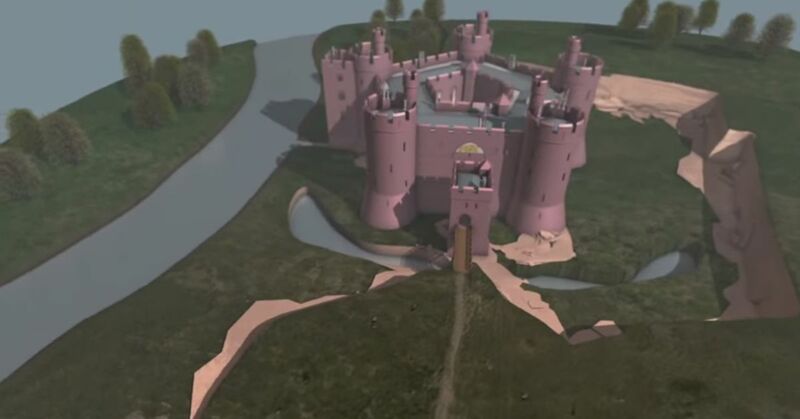 Archaeologists in Monmouth have discovered the remains of an ancient wooden building that dates back 5,000 years. Steve Clarke, who two years ago uncovered the remains of a huge post-glacial lake at the Parc Glyndwr building site, said the timber remains found under the new Rockfield estate were once part of a crannog, an ancient fortified dwelling built into a lake. 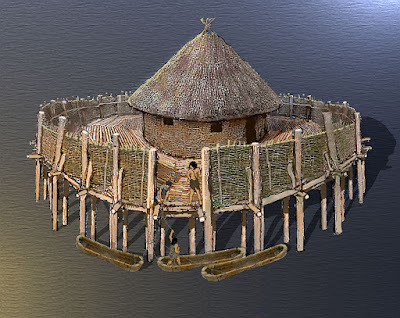 Part of the wooden building set into the bed of what was once Monmouth’s prehistoric lake, pre-dates the only other known crannog in England and Wales by 2,000 years. IPPLEPEN, England, July 27 (UPI) -- The excavation of an ancient Roman road that once ran through the British Isles has yielded a unique archeological find. Researchers with the University of Exeter has uncovered fragments of an ancient storage jar. Archaeologists have been excavating the road, complete with potholes and wheel ruts, for nearly a year. Their work has offered new insight into how the communities of Roman Britain functioned. The latest clue as to what life might have been like 2,000 years ago, near Ipplepen, England, is a pottery fragment -- a large piece of what's referred to as an amphora. The storage jar was likely used to carry food stuffs across Europe, from Rome to "Britannia." Archaeologists say the jar likely carried olive oil or wine. 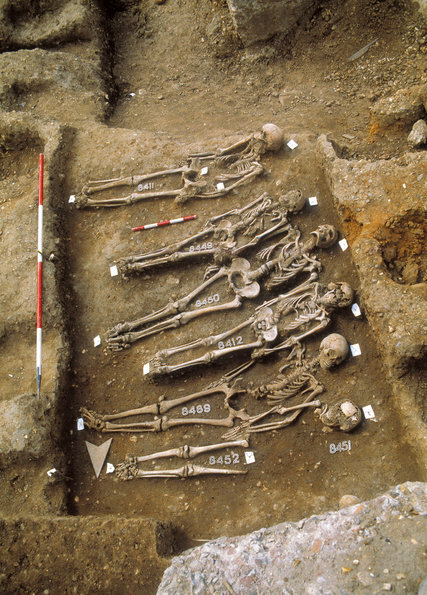 A mass grave with more than 20 medieval skeletons has been hailed a “major discovery”. The remains, thought to date back to the 13th century, were discovered during installation works at a top private school in Scotland. 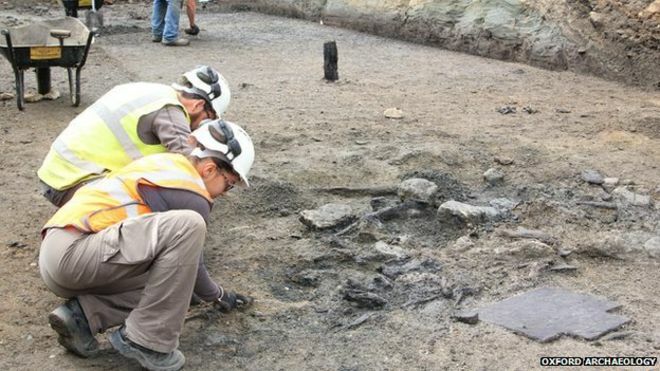 The bones were buried less than two feet underground in the quad area of the site and are now being examined by experts with a view to being reburied. Robert Gordon University, in Aberdeen, ordered the boiler work - but the skeletons were discovered in the grounds of the neighbouring private school Robert Gordon College. Contractors installing cables found the first skeleton near Schoolhill main library and called in Aberdeenshire Council archaeologists to carry out further excavations in the area. A 300-metre section of an ancient carriage way dated to the 4th century BC was discovered by archaeologists at the Megalo Kavouri beach in the southern suburb of Vouliagmeni, the ministry of Culture announced on Monday. The road, paved with small stones placed close to one another, varies in width from 1.90 metres to 6.10 metres. It is delineated by retaining walls on either side that also serve to keep the pavement stable, as the earth underneath is soft and sandy. 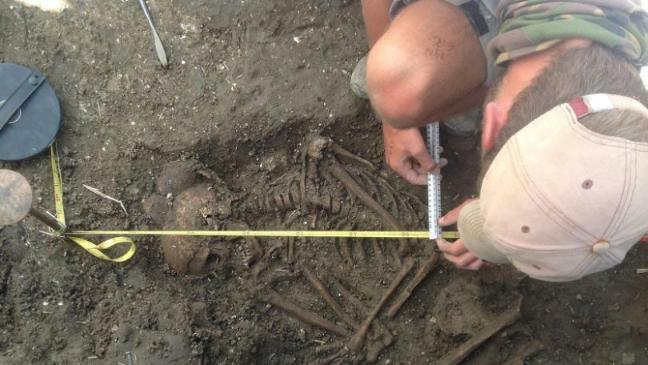 A 4,000-year-old Bronze Age skeleton, believed to be that of an adolescent child, has been unearthed by archaeologists. 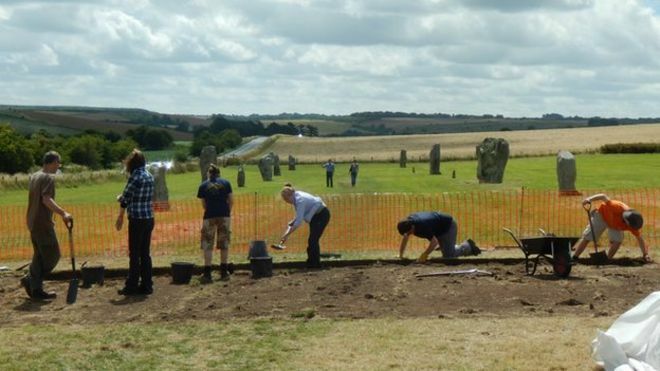 The rare discovery was made by a team from the University of Reading, who are excavating Wilsford henge in the Vale of Pewsey, Wiltshire. The body, around 1.5m in length, was found in a foetal position and was wearing an amber necklace. Efforts will now be made to determine the age and gender of the child and where they were from after the find was made on Tuesday. Archaeologists have unearthed a wooden island old enough to have been built by the Flintstones under a modern Barratt estate. The fortified farmhouse on stilts in the middle of an ice age lake is so old it could have even been built before Stonehenge was created. At 4,900 years old it's probably even older than the Pyramids and was probably built to provide a natural moat to protect the rich inhabitants from attackers in an area that is now on the Welsh borders. It was around the time early man started to live communally and archaeologist Steve Clarke says it is only the second "crannog" to be found in England and Wales and much older than the first. 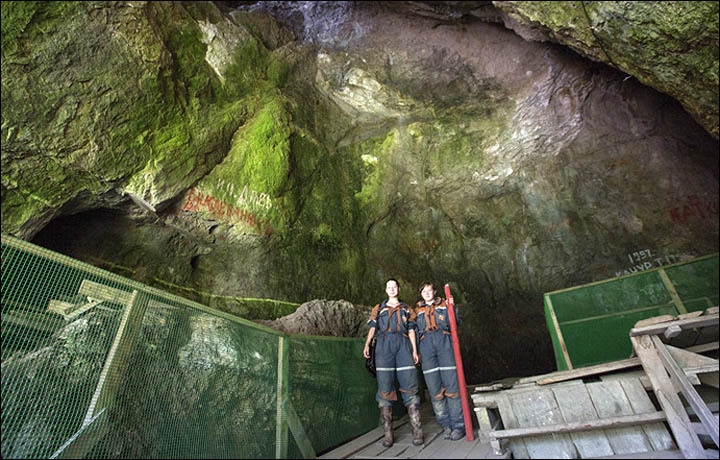 Bei Ausgrabungen in der Höhle Hohle Fels auf der Schwäbischen Alb nahe Schelklingen hat das Team von Professor Nicholas Conard aus der Abteilung Urgeschichte und Quartärökologie der Universität Tübingen einen rätselhaften Fund gemacht: ein aus zwei Teilen zusammengesetztes Bruchstück aus Mammutelfenbein. Von Menschenhand bearbeitet, weist das Fragment deutliche, tief eingebrachte Rillen in musterhafter Anordnung auf. 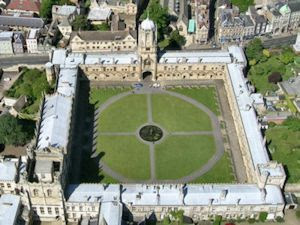 "Rare and exciting" leather and wooden objects 700 years old have been found at an archaeological dig in Oxford. Experts uncovered 50 medieval leather shoes and a bag as well as a wooden bowl and timber posts at the Westgate Shopping Centre excavation. The objects which "tell us about everyday people" have been so well preserved because the Thames floodplain area is below the water level. Project director Ben Ford said: "These finds are as rare as gold." 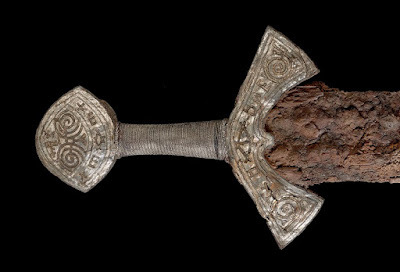 The last Viking and his 'magical' sword? Have you held the sword? Have you felt its weight? Have you felt how sharp and strong the blade is? A deadly weapon and symbol of power -- jewellery for a man, with magical properties. The sword gave power to the warrior, but the warrior's strength could also be transferred to the sword. That is how they were bound together: man and weapon, warrior and sword. This sword was found in Langeid in Bygland in Setesdal in 2011. It is a truly unique sword from the late Viking Age, embellished with gold, inscriptions and other ornamentation. The discovery of the sword has not been published until now, when it is being displayed for the first time in the exhibition 'Take It Personally' at the Historical Museum in Oslo. The sword must have belonged to a wealthy man in the late Viking Age. But who was he and what magic inscriptions are set into the decoration -- in gold? Was the owner of the sword in the Danish King Canute's army when it attacked England in 1014-15? That’s right – there are only four days until we join The Salisbury Museum and friends for our annual Festival of Archaeology celebration. 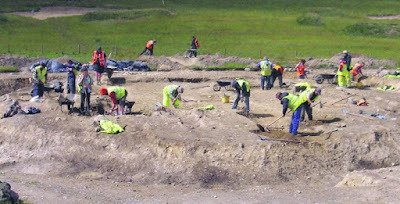 This Saturday and Sunday Wessex Archaeology will be at Salisbury Museum. Come and join us to see some of the finds our Coastal & Marine team have investigated, dig deep in our mini digs to complete our Collection Countdown challenge, and meet our engaging staff who are happy to answer all of the questions that you never knew you had about commercial archaeology. Did we mention it’s entirely free? 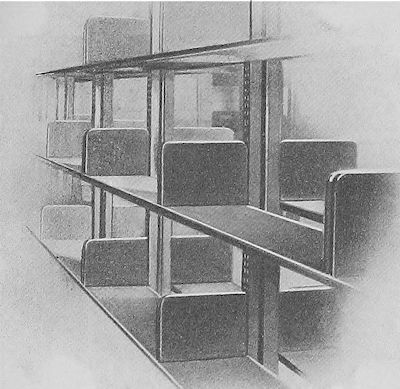 The Museum is open from 10am Saturday 18 July and 11am Sunday 19 July 2015. There will be a whole range of talks and events taking place. Contrary to what was previously believed, the bacterium responsible for the Black Death probably caused small outbreaks of lung disease for many years before it evolved its better-known bubonic form, according to a new genetic study. Also, only one added gene was needed to turn the Yersinia pestis bacterium into a killer, and only one tiny mutation in that gene was needed to give it two ways of spreading — by cough or by flea bite, said Wyndham W. Lathem, a microbiologist at Northwestern University Feinberg School of Medicine who oversaw a team inserting genes into ancestral versions of Y. pestis in mice. During last year’s Ebola outbreak in West Africa, some feared that the disease, which spread through blood, vomit and feces, could become airborne. 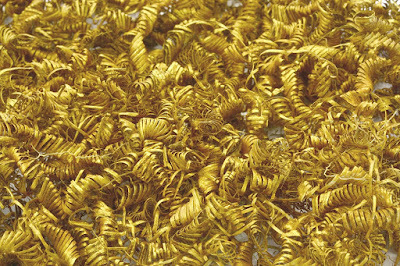 Archaeologists have discovered about 2,000 little gold spirals from the Bronze Age in a field near Boeslunde in Zealand. The longest of the many spirals are around 3 cm in length and are all produced from thin and flat golden thread dating from 700-900 BC. The find, in an area of Zealand considered one of northern Europe’s best places to find gold artefacts from the Bronze Age, remains as mysterious as it is sensational. The bones, discovered in Dorset by archaeologists, appear to have been deliberately rearranged by Iron Age Britons in order to create hybrid beasts, half one creature and half another. Archaeologists digging on Lækjargata in central Reykjavik were looking for traces of a farm cottage built in 1799 – and found a Viking longhouse from some 900 years earlier. The longhouse is at least 20 m long at 5.5m wide at it widest point. The ‘long fire’ in the centre of the hut is one of the largest ever found in Iceland, which visible traces suggesting it was over 5.2 m long. Extremely rare ancient Roman frescos, comparable to those found in the Villa of Mysteries in Pompeii, have been uncovered in the historic southern French city of Arles. Photos of the ancient painting were released Friday after the mural from a villa bedroom was found in April. The first full mural in the Pompeii style in France from between 20 and 70 BC has been found in Arles. 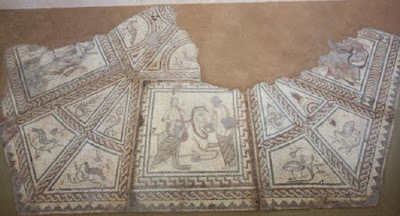 Archaeologists from the Museum of Ancient Arles collections have been working to recover the remains of the Roman villa since 2014. 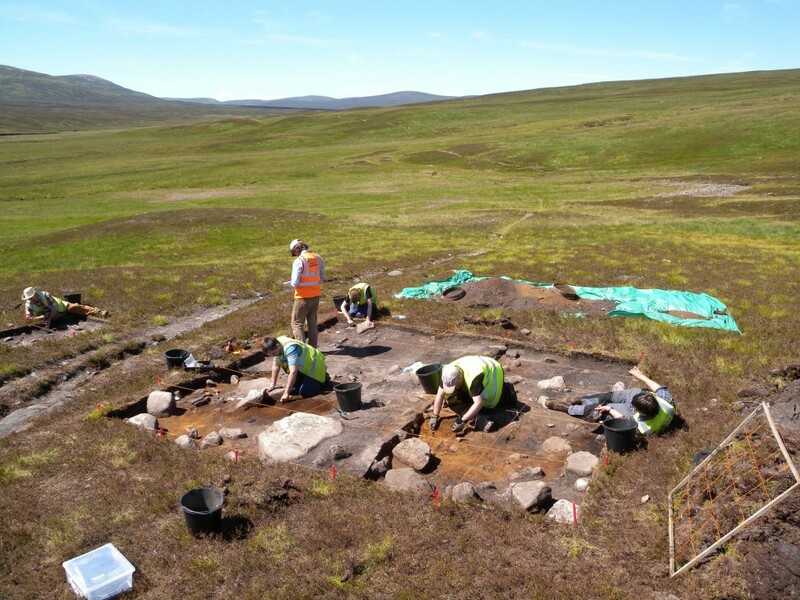 Archaeologists working on the National Trust for Scotland’s Mar Lodge Estate in Aberdeenshire have uncovered evidence that people were active in this mountainous landscape thousands of years earlier than previously thought. Excavations at sites deep in the Cairngorm glens have produced radiocarbon dates which demonstrate a human presence as far back as 8,100 BC, with some places being revisited over many thousands of years. Robbed of stone to build Eaton Hall in C17, little today remains of the Edwardian castle of Holt a favourite of Richard II’s. Towards the end of his reign it became Richard’s royal treasury storing an estimated 100,000 marks (£66,000) just before his downfall. This amazing work was done by combining their extensive knowledge and expertise with a variety of historical sources such as inventories, antiquarian drawings and plans as well as the results of recent excavations. “You(r) Archaeology – portraying the past” - A European competition to express your view. What is archaeology? An adventure? A pain in the neck? The appeal of the past, the magic of marvellous sites, the boredom of a dusty museum? Probably all of these together, and still more. Up until July 31st 2015, all European citizens can answer the question and tell us about their idea of archaeology by entering a drawing, painting, photo or video in the European competition “You(r) Archaeology”.